The symptoms of Legionnaire’s disease are similar to those associated with other forms of pneumonia, including severe coughing, shortness of breath, chest pain, stomach pain, and confusion. If left untreated, or in cases involving patients with weakened immune systems, the disease can lead to fatal complication, such as respiratory failure, kidney failure, and septic shock. As noted above, Legionnaire’s disease is usually spread through the inhalation of microscopic droplets of water. The bacteria responsible for causing the disease multiplies very quickly in large commercial and industrial plumbing systems, such as those found in large nursing homes, veteran’s homes, and other skilled nursing facilities or rehabilitation centers. Examples of places where the bacteria that causes Legionnaire’s disease may be found are in hot tubs and swimming pools, misting machines like those found in grocery store produce aisles, decorative fountains, air conditioning systems, and complex water systems. In theory, it is possible for the bacteria to spread through a residential water system; however, that is the rare case. Given the manner in which this bacteria spreads, it is incredibly important that facilities caring for older adults or those with weakened immune systems take the necessary precautions to ensure the facility’s water systems are sanitary. Anyone who has a loved one in an Illinois nursing home who has contracted Legionnaire’s disease, or any other disease, should consult with an Illinois nursing home attorney to discuss their case. 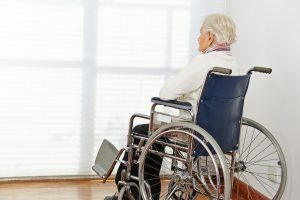 If you believe that your loved one has been exposed to unsanitary conditions, or has been the victim of nursing home abuse or neglect, you should consult with the dedicated Illinois toxic tort attorneys at Moll Law Group. At Moll Law Group, we represent injury victims and their family members in all types of claims against Illinois nursing homes, including those involving outbreaks of preventable diseases such as Legionnaire’s disease. To learn more, call 312-462-1700 to schedule a free consultation to discuss your situation today. Defective Design Lawsuit Claims Keurig Coffee Machine Caused House Fire, Illinois Injury Lawyer Blog, May 19, 2017.